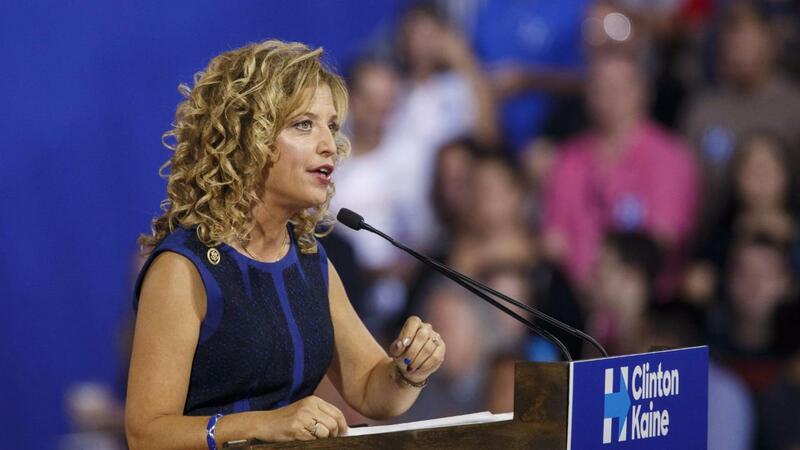 PHILADELPHIA -- On the eve of her party's national convention, Democratic Party chair Debbie Wasserman Schultz announced she would resign her post later this week, in what is the culmination of deep-seated animosity towards her among progressives who are threatening to shred the unity presumptive presidential nominee Hillary Clinton is seeking to showcase here. In a statement Sunday, Schultz said the best way to accomplish the election of Clinton is to relinquish her chairmanship when the Democratic National Convention comes to a close Thursday night. But in a sign the Florida congresswoman is still determined to be heard before what could be a crowd of hostile delegates, she also indicated she still planned to speak. "As party chair, this week I will open and close the convention and I will address our delegates about the stakes involved in this election not only for Democrats, but for all Americans," she said. Schultz's imminent departure casts a cloud over the start of the Democrats' four-day convention as it underlines the remaining divisions between the liberal supporters of Bernie Sanders and the party establishment that's been loyal to Clinton. DNC vice chair Donna Brazile, a longtime party activist and consultant, will serve as interim chair through the November election. The publication of 20,000 DNC emails by Wikileaks over the weekend made it immediately clear that Schultz's five-year tenure was in peril. The Wikileaks publication exposed what many Sanders supporters had feared all along: That the party apparatus was working to tilt the primary scales in favor of Clinton. One email, sent by DNC chief financial officer Brad Marshall on the eve of May primaries in Kentucky and West Virginia appeared to question Sanders' faith, without mentioning his name. "He had skated on saying he has a Jewish heritage. I think I read he is an atheist. This could make several points difference with my peeps. My Southern Baptist peeps would draw a big difference between a Jew and an atheist," wrote Marshall in the May 5 email to three other DNC colleagues, including chief executive officer Amy Dacey. Dacey replied in all caps, "AMEN." Marshall apologized on Facebook on Saturday. In multiple television interviews Sunday, Sanders reiterated his previous calls for Wasserman Schultz to resign and other Democrats struggled to defend the embattled chair, a clear sign that her support within the party was evaporating quicker than dew on a steamy summer morning. Hours later, it was announced that Wasserman Schultz would no longer preside over the convention and would be replaced by Ohio Rep. Marcia Fudge. By then, the writing was on the wall: Schultz's position was untenable. Eager to move past the unseemly storyline, the Clinton campaign first charged that Russian hackers were attempting to assist Republican nominee Donald Trump's election through the leaks. Later, Democratic the nominee-in-waiting Clinton thanked Schultz for her service and appointed her an honorary campaign co-chair. Meanwhile, Sanders forces claimed a long-sought scalp. "While she deserves thanks for her years of service, the party now needs new leadership that will open the doors of the party and welcome in working people and young people," Sanders said in a statement. "The party leadership must also always remain impartial in the presidential nominating process, something which did not occur in the 2016 race." Democrats, even those who are friends and colleagues of Schultz, said the change was important in order to avoid a divided convention floor. "Every effort is being made to unify the party, if this helps in unifying the party I think it's the right decision," says Rep. Adam Schiff, a Democrat from California. "Debbie's a friend, so I'm sad to see it come to this, but I think she's doing what's in the best interest of the party. It means there's one less point of friction between the Sanders campaign and the Clinton campaign. It's all about electing next president, not about the party or even the party chair." What was less clear among party leaders is whether Schultz should take the podium at all, or fade slowly into the night -- and out of Philadelphia. "I think that it's now a decision of the Hillary Clinton campaign," says New York Rep. Carolyn Maloney. If Schultz ends up taking the dais, even briefly, it could set off emotions reminiscent of Sen. Ted Cruz's speech at the Republican National Convention, where in his refusal to back Trump, he was roundly booed off the stage. SEE ALSO: Republicans chanted 'lock her up' at the RNC, but what do delegates really think? The demise of Schultz comes following a prolonged primary fight in which she was seen by liberals as an unfair arbiter on a mission to protect Clinton. The disillusionment with the process is already on vivid display in Philadelphia, where legions of protesters have already begun congregating on the outskirts of the Wells Fargo Center and a few miles away downtown. Some weare still holding "Bernie 2016" signs. Other placards read "Party Insiders Rigged The Election," and "Support Democracy, Vote No On Hillary." Erin Stillson, a 30-year-old Sanders supporter from Vermont, is staying in a pop-up camper with her husband and two children to help foster unity not around Clinton -- but around progressives. "I'm here because I'm very committed to bringing the national revolution that has been ignited by Bernie back to Vermont. I'm not trying to unify with Hillary. Most people are trying to unify against Hillary honestly," she says. "In Philadelphia, I have not met very many Hillary supporters. It makes me question the legitimacy of the vote for her." With the Wikileaks DNC emails still being unearthed, ardent and agitated Sanders supporters now have a new impetus to disrupt the proceedings that will culminate with Clinton's formal acceptance of the nomination Thursday night. Some have floated attempting to prevent the vice presidential nomination of Sen. Tim Kaine of Virginia -- a hopeless effort that would mostly serve as a symbolic protest. But Sanders' speech to the delegates on Monday, the opening night, could serve as a strong signal to his followers on how to exert their energy. Then again, some of these hold-outs will be even out of reach for him. Maloney, who knows Sanders well from his time in the U.S. House, says she has no doubt that Sanders will trumpet a message of a harmonious alliance. "There's never been a sharper division between the Republican platform and the Democratic platform. I believe strongly Bernie Sanders and his followers will be strongly supporting Secretary Clinton. There's not a question in my mind," she says. But after Democrats reveled in the disorder at last week's Republican National Convention in Cleveland, it now looks like they may have almost as many raw wounds to heal.